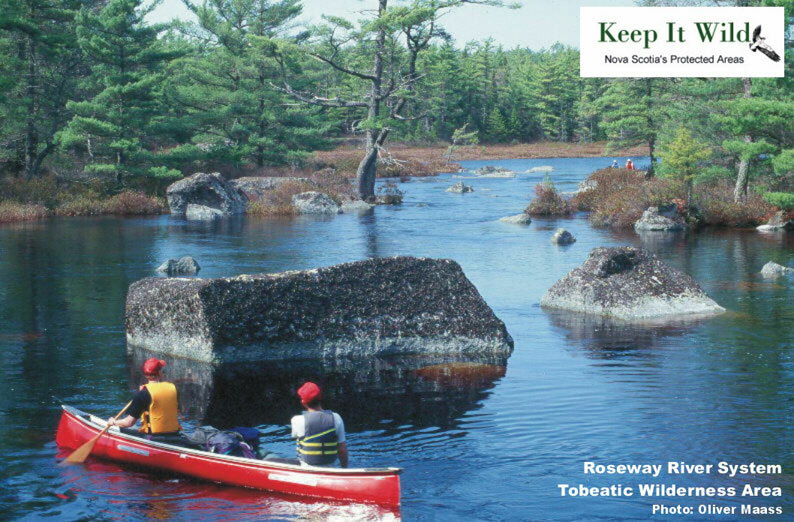 Spanning parts of 5 counties, the Tobeatic Wilderness Area is the largest remaining wild area in the Maritimes. The region is characterized by unique barren and semi-barren landscapes with outstanding undisturbed glacial landforms including esker fields, moraines, kettles and outwash plains. It protects remote and undisturbed wildlife habitat, protects expansive wetlands, pockets of old-growth pine and hemlock forest, and the headwaters of 9 major river systems flowing to both the Atlantic and Fundy coasts. Taken together with the neighbouring Kejimkujik National Park and Historic Site the Tobeatic Wilderness Area forms the central core of an expansive protected landscape within interior southwestern Nova Scotia. The Tobeatic Wilderness Area makes a significant contribution to the protection of biodiversity in Nova Scotia. It is also a refuge for wildlife, and has been managed to achieve these purposes since a portion was designated a Game Sanctuary in 1927, and later a Wildlife Management Area in 1968. Today the Tobeatic Wilderness Area continues to provide protection for native biodiversity, with undisturbed wildlife habitat for many species, including a small but provincially significant remnant native Nova Scotia moose population, healthy and abundant black bear, and a re-introduced population of American marten. Within the Tobeatic lie the spectacular forests of old-growth pine and hemlock found at Sporting Lake Nature Reserve and Silvery Lake (IBP site), and outstanding examples of fire barrens at the Shelburne Barrens (IBP site). The Tobeatic is interconnected by lakes, streams and rivers, offering outstanding wilderness canoeing, camping and hiking. It is a storied region of the province known best for its moose herd, trout streams, and rugged canoe routes through rocky lakes and wild rivers. These routes, first traveled by Mi'kmaq, supported a world-class "sportman's" guiding tradition through the late 19th and early 20th century. The traditions of hunting, fishing, trapping and guiding are alive today, with the travel ways of the Tobeatic frequented by local recreational enthusiasts, youth organizations, and professional outfitters alike.